Sweet treats | Ah, India! Well, we got home to Adelaide after 4 fabulous weeks away. 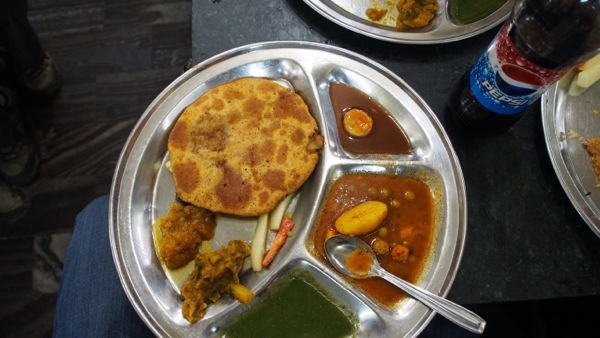 I promised a blog about some of the fabulous food we ate on our way around India and Malaysia so here we go. Some pictures may already have been used in other posts. First day in Delhi we spent with the lovely Lachan, an Autorickshaw driver who dropped us off at a restaurant in New Delhi. 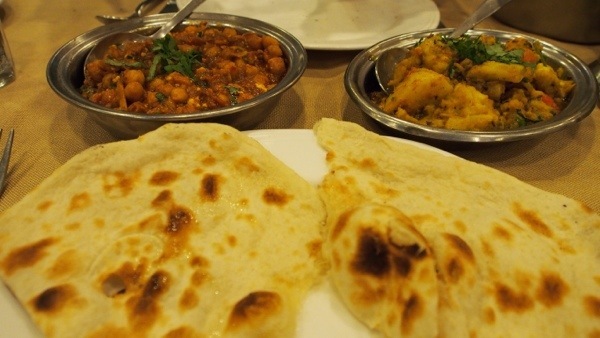 We has some naan bread, a chana (chick pea) masala and an eggplant and potato dish. We were pretty amazed at how fresh the naan bread was everywhere we had it. 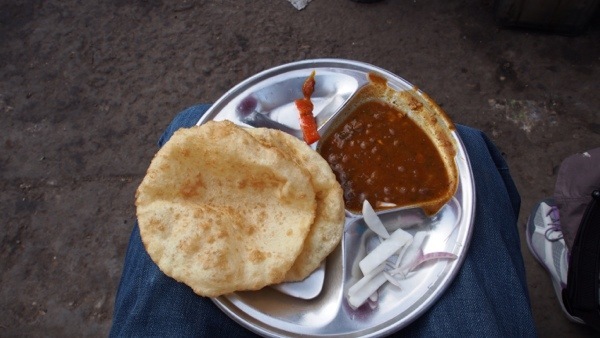 On day two we ate from a street cart in Old Delhi near the Red Fort and Bazaar area. It was surrounded by local tuk-tuk and cycle rickshaw drivers. The cook was preparing each bit of chapati bread freshly. He looked clean as did the customers. The dish was a simple, spicy Dahl with a bit of onion and pickled vegetables. And that bread, freshly rolled out then dropped in oil till it puffed and browned. Then it was cooled a minute on some paper and served. A yoghurt is a big part of the diet in India and was readily available in most places we travelled. 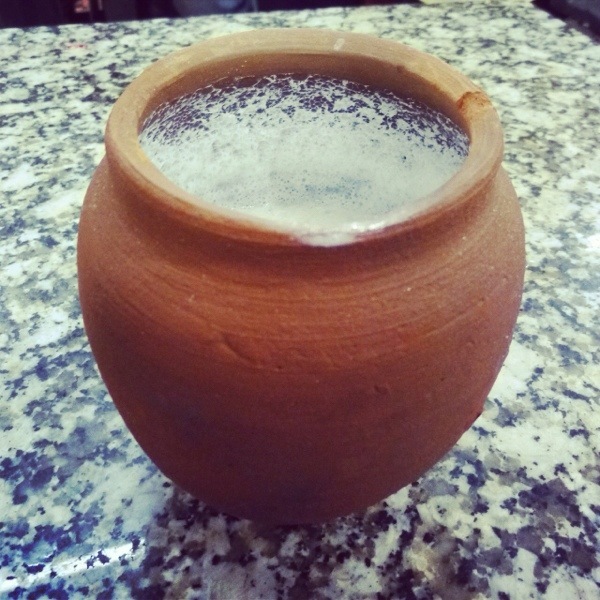 A Lassi is a slightly sweetened yoghurt drink, sometimes blended with fruit and sometimes plain. I found it a nice filler during the day between meals or instead of dinner if we’d had a late lunch. The food at an eatery inside the bazaar costs about ten times more than that prepared on the street carts and is only slightly more substantial. Both were very cheap. The equivalent of about 12 cents on the street and about $1 inside the bazaar. It’s was a little more filling and the bread was a paratha, filled with veggies and cooked on a hot plate rather than in oil. In the small town of Orchha we spend a few hours doing a cooking demonstration with the wonderful Vandana. This charming and industrious woman has taken her passion for cooking and made a business of it. She contributes to her family income and also employs her sister-in-law sometimes as a kitchen helper. We helped with some peeling and chopping too. 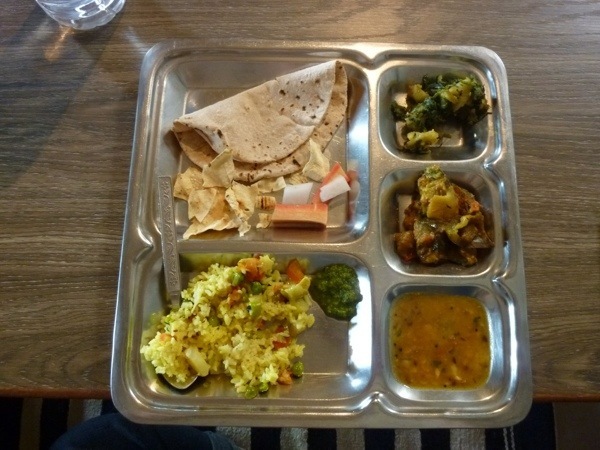 The dishes prepared and eater were all vegetarian. Cumin potatoes with spinach, eggplant, dahl, biryani, homemade chapatti bread and a spicy dipping sauce and crunchy veggies. We also learned how to make proper Masala Chai. 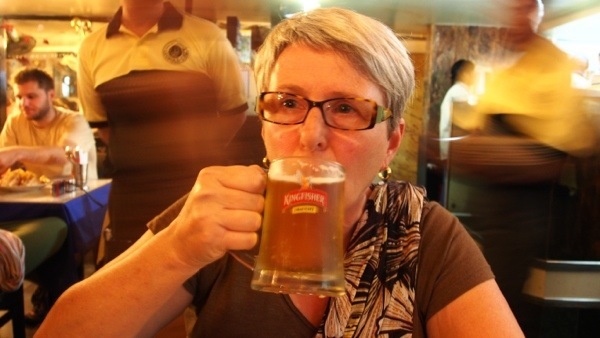 It was great in India and I hope next winter to brew up our own batch from time to time as Vandana provided us with a copy of all the recipes! 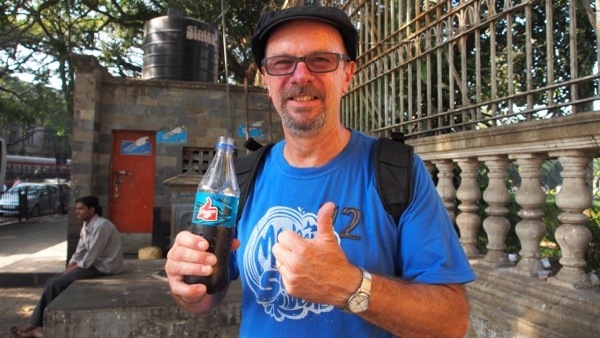 Ten of our 20 days in India were spent with a small group from Intrepid Travel. 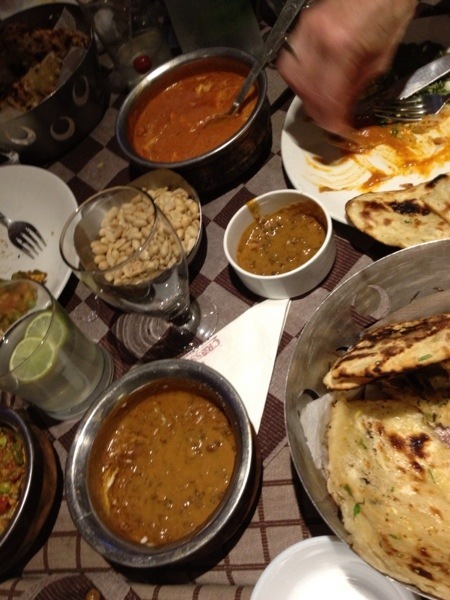 On our final night together we had a feast of vegetarian dishes, rice, bread and Butter Chicken. 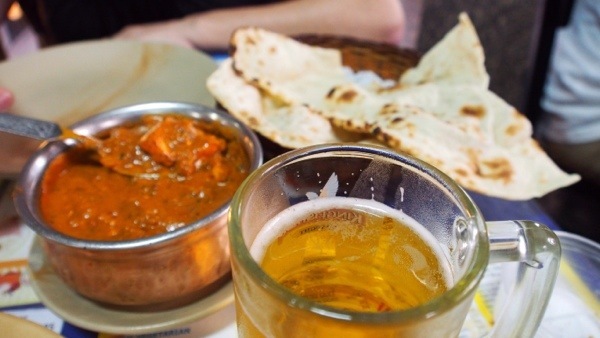 Beer and a Paneer (like a firm cottage cheese or haloumi cheese) tikka masala are perfect partners in Mumbai’s humidity. One night we has the same with chicken instead of Paneer. One of the few meat meals we ate was at a shish kebab joint in Mumbai where the meat is cooked outside on skewers over coal and the bread rolled out and cooked over the bottom of a wok-like pan. 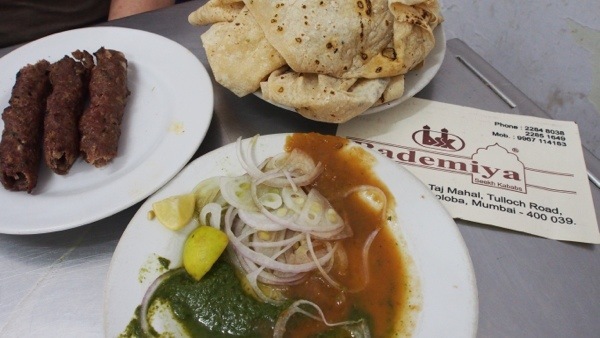 The bread is called a rumali roti and is delicious and pliable for grabbing the meat and dipping in the plate of spicy sauces and raw onion. And did I mention it was dirt cheap? 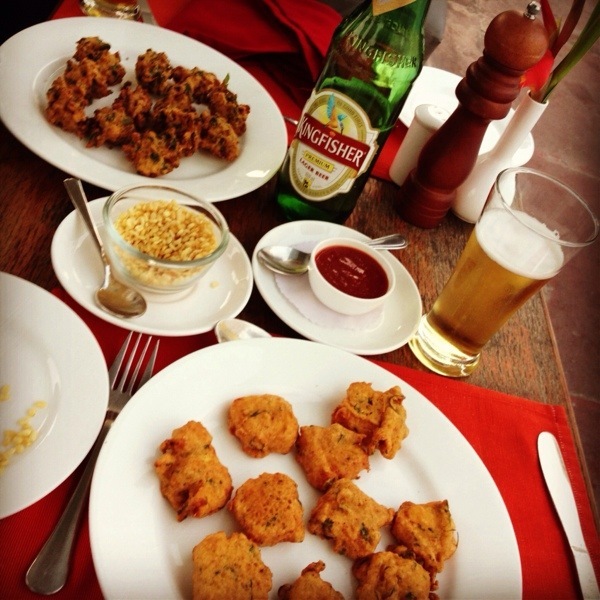 In Udaipur we had some memorable meals but the afternoon snack of beer and pakoras was a real treat from the rooftop of our hotel, sitting alongside the refreshing pool and looking over the lake and the town. The ones pictured are mixed veggie on one plate and Paneer on the other. 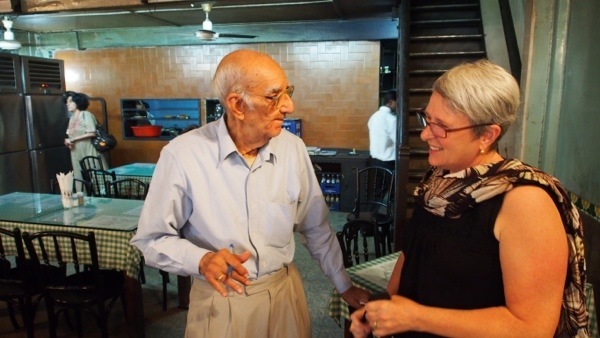 I have already sung the praises of a Parsi restaurant in Mumbai called Brittania where we were served by the original owner’s son, Boman Kohinoor. Boman is a charming and chatty 80-something year old. Here we ate a wonderfully tasty and zingy Berry Pulau with Chicken. 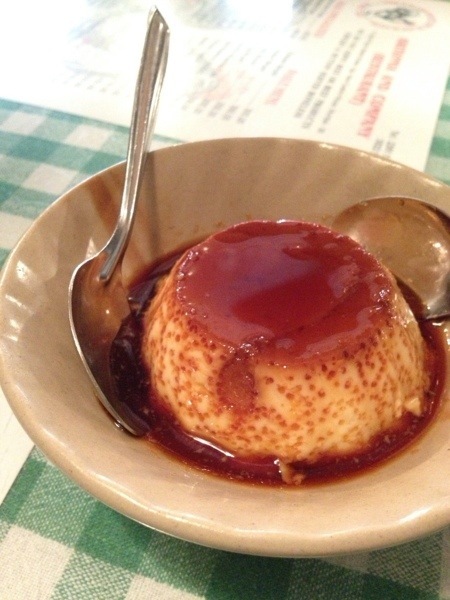 Desert was a perfect caramel custard. 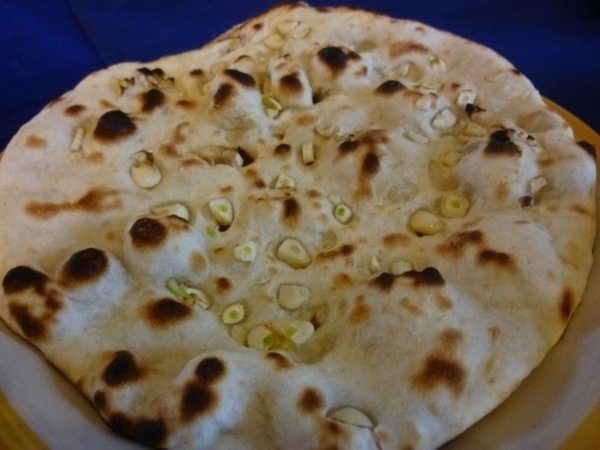 Somewhere along the way we has garlic naan bread that was literally studded with garlic. There was enough here to keep a heap of vampires away! I urge you to go to India at least once in your life. Don’t have too many notions about how it will be. Also don’t go expecting a relaxed and luxurious holiday. India is a fabulous, mixed up, noisy and thoroughly visceral experience that will amaze you at every bend in the road!